You’ve spent hours acquiring and processing the perfect image. It looks great on your big new computer monitor, but you have to pan around to see the whole image in full detail. You want a beautiful print for mom and dad’s living room wall to thank them for buying that first telescope. Do you just take your digital file down to the photo lab or run it off on your color printer? Without care astro prints can be disappointing when compared to their digital versions on screen. What works well for a family snapshot, can be like having your telescope's objective cloud up with dew for astrophotographs. When printed with the right care astrophotographs can glow with all the detail seen at your telescope. If you want prints that get a "Wow, is that real? Did you do that?" reaction, then read on. The human eye can see a tremendous range of brightness. One measure of this is the dynamic range or contrast ratio between the brightest and darkest colors. Exact numbers are difficult because they depend on the details of measurement, but this ranges from the order of a million to one if the eye is allowed to adjust to about 15000:1 in a single glance at a small area. A high end camera might be able to capture a range of 16000:1 (14bits or stops), but in practice is usually a bit less than the eye can see, because the eye can adapt as it focuses on different features in the scene. It takes a lot of work to capture and process your data, to get an image to look good on your monitor. An LCD monitor can have a 300 to 1000:1 dynamic range and some have an extended color gamut. As long as the image is carefully processed, details are preserved and our adaptable eyes don’t notice the change in contrast. Printing to paper can reduce contrast to as low as 60:1. Seeing less than 1/2 % of the original contrast makes it hard for even the non-critical eye to be awed by the glories of nature. With the right post processing, printing, and mounting choices your image can still look great. Let’s take a quick look at the key steps. Camera sensors and displays are roughly linear devices, but your eye is non-linear. Gamma curves are used by your computer used to correct for this. Make sure that your computer and screen are calibrated to a suitable gamma, usually 2.2. This requires setting monitor brightness and contrast for the lighting in your room, and then adjusting each color output by your computer. This will make sharing and printing your image much easier. An accurate calibration requires a special tool, but it is possible to do an approximate job by eye with software tools. There is probably one of these hidden in your operating system display preferences. There are lots of resources to help you learn to post process your images to display well on your calibrated screen. Let's skip to our starting point for printing: your final image optimized for your calibrated screen. Before you proceed you must decide how you are going to print your image. Your post processing with stretching and gamma correction has created a beautiful image on your monitor which has roughly 10 times less dynamic range than your original image. Making a print requires squeezing all that astro goodness into even less dynamic range. Images printed on paper range from 50:1 to 200:1 in contrast and differ in color rendition. A four times difference in dynamic range really matters. Picking a printing paper or other medium, that gives the brightest whites and blackest blacks with good colors, can make the difference between a dull image and "Wow!". With your display calibrated and your target media identified, the next step is to produce and image file optimized for printing. 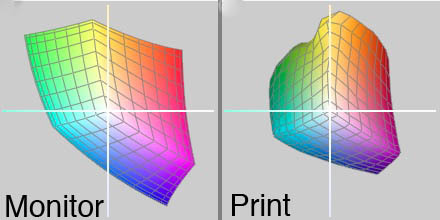 Differences in color rendition of different media are described by color gamut, a measurement of the colors that can be displayed. A color gamut is represented by a description called an ICC profile. Many photo labs and printer manufactures publish ICC profiles for their products. If they don’t, you probably need to use a different lab. Image processing applications like Photoshop allow you to install ICC profiles and to see a preview approximating what your printed image will look like. This allows you to adjust a version of your image which will print well without details and colors being lost. Another thing to keep in mind is the large differences in dynamic range between different print media. 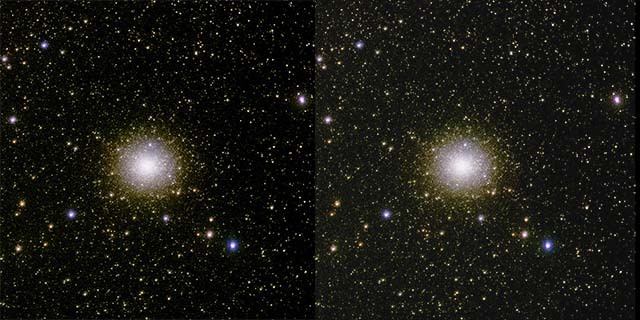 A lot of the impact of astro-photos is in the dynamic range of the image. In addition to paper based prints, you can now choose media like plastic coated metal that can give dynamic range much closer to that of an electronic display. High dynamic range metal prints have that "glow" that gives the emotional impact of looking through a telescope eyepiece. Prints should not show pixelation at a normal viewing distance. Depending on the size and location this is typically 150 to 600 pixels per inch. Photo labs will scale your image to fit the size print you request. You can get much better results by scaling and cropping your image to the resolution and aspect ratio that the lab will print. This allows you to have exact control of cropping and to pick the scaling algorithm that gives the best results for your image. By default most labs will color correct images. This is done because most image files have not be color corrected, and they want to ensure that flesh tones look natural and avoid returns. Astro-photographs have no flesh tones and you have already applied your own color correction using the ICC profile. Be sure to specify no color correction. You have done a better job than any algorithm or photo technician can. Correcting with an ICC profile is not perfect. Ask around to find labs that produce high quality, consistent prints. If your image has delicate colors, you may want to get small proof prints before committing to a large print. Matte finishes don’t show strong reflections but catch ambient light from all directions. Contrast is reduced no matter how lighting is arranged. Glossy prints show much higher contrast with good lighting. Either print on rigid media or mount on a rigid flat backing that prevents any curl or wrinkles in the print. Gator board and foam backings perform well. Heavier papers are more rigid. Any wrinkling will catch stray reflections and interfere with the enjoyment of your print. Framing and mounting your print can be the most costly part of a print. Fortunately there are lots of choices and you can have high quality prints inexpensively if you make the right choices. A traditional framed image adds considerable expense for the frame and mat. If a glass is used the contrast of your image will be reduced and astro-photos have precious little to lose. Glass with anti-reflective and ultraviolet protective coatings is available and much better than frosted or clear glass, but expensive and it still reduces the contrast of your image. If a paper print is irreplaceable (think of an original Ansel Adams "Moonrise over Hernandez, New Mexico") then you probably want to put it under glass and control humidity in the room. Fortunately there are media and mounting alternatives available which can eliminate most of the cost of framing while giving the best view of your image. An alternative to the traditional framed print is a floating mount. By eliminating the cost of frame, glass, and matting costs can either be reduced or put into higher quality printing, papers or metal prints. For paper prints, foam or gator board backing mounts can provide a rigid easily wall mounted platform for your image. These are inexpensive with nothing to reduce contrast between the viewers' eyes and your image. If you want a more durable and higher dynamic range print than exposed paper on a rigid mounting, metal prints are an superior alternative. They are strong and rigid. They are easy to clean, with the image dyes diffused into a plastic layer on the metal with none of the disadvantages of glass. Accelerated aging tests show that dyes in a metal print retail their colors for up to three times longer than colors in a paper print. Metal prints are easily framed, no glass needed. The frame is simply hung on the mounted picture with no glass giving the look of a traditional framed print with a higher quality image. Passive prints are not the only option. Active displays can capture the luminosity of astronomical images. They may be less sensitive to stray reflections than prints. High quality electronic LCD or OLED panels in digital photo frames can display individual images or slide shows. Transparencies can be mounted in backlit frames for a luminous display. Wiring is necessary to supply power. Next time you make an astronomical print, do you feel like you are looking through a telescope or space ship porthole? If not think about what you’ve learned here and how different choices affect the result. Make the right choices, to avoid distractions, preserve dynamic range and colors. 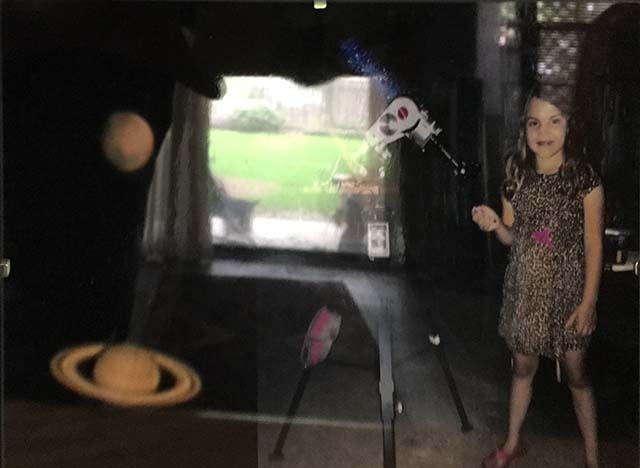 Your prints can generate the excitement that looking through a telescope brings.